For ChildFund’s Tenagne Mekonnen, a trip to the Boset Borchota district a few years ago was a journey into a lush, fertile land full of life and growth. Now after a prolong drought, the difference is profound. We lost our crops and water because of shortage of rain which has brought food crises and with no water to drink….. Life is very hard! A few years ago I travelled to the Boset Borchota woreda, or district, a place where it was very green and fertile. As we visited homes throughout the community, I took great pleasure in seeing the bountiful harvest of grains, vegetables and fruits. The livestock appeared plump and healthy. Proud farmers invited us to taste their fruits and grains. What a different sight met me on my recent visit from our office in Addis Ababa, Ethiopia’s capital. There had been no harvest, and the livestock were cruelly thin. Once-fertile lands were now dry and filled with dust. The dust was everywhere — I couldn’t even see the vehicle in front of us. I could barely take it in; the difference was so profound. With great heaviness in my heart, I visited some homes and talked with families and children. One mother of seven, Sequare, (pictured below) spoke to me at length. 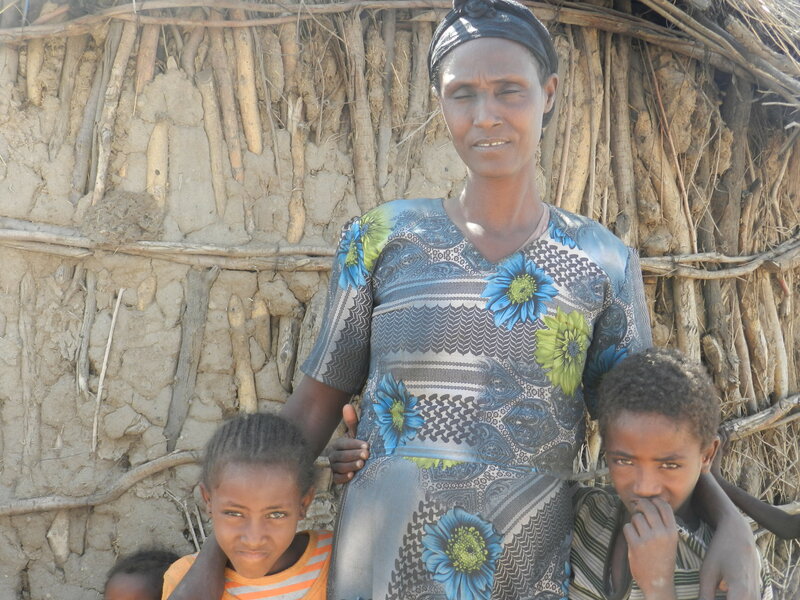 Sequare stands with two of her seven children at their home in Boset, Ethiopia. Of her seven children, four attend school. Because she no longer can feed her children from what her farm produces, she prepares their meals from government distributions of corn and oil, and supplementary food provided by ChildFund. “They eat less,” Sequare said. And what they do eat is not as nutritious as the varied diet of dairy, meat, vegetables and lentils they once enjoyed. One of her children tends toward sickliness and misses school at times. She worries this child’s health will worsen. “I am tired,” Sequare said. “Every morning we wake up and look for the rain to come, but it is dry here in Borchota.” She said if the drought continued like this, they would migrate to the city in search of food. 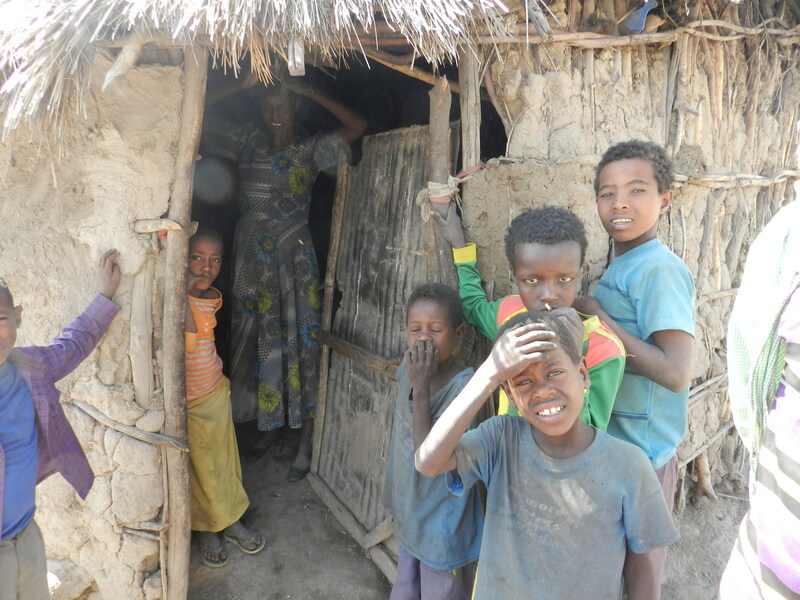 Sequare looks out from her home at six of her seven children, four of whom are in school. 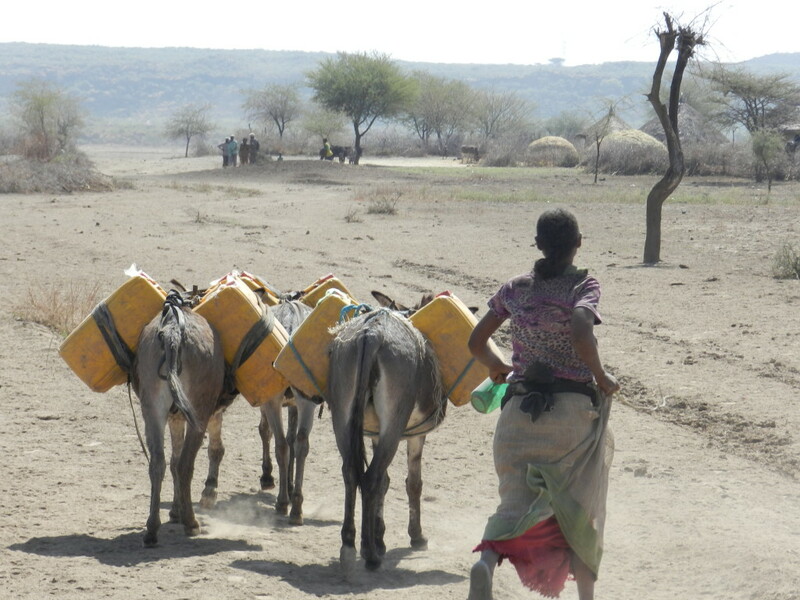 The drought and resulting food shortage in Ethiopia are expected to continue for up to a year. A strong El Niño weather phenomenon caused greatly diminished rainfall in the brief rainy season of spring, known as belg. Farmers in the Oromia region, where Sequare’s home is located, depend on the belg rains for their crops and livestock fodder. But the drought’s effects are more widespread than this region. The government of Ethiopia recently expanded its estimate of the number of people needing food assistance to 10.1 million people. ChildFund, which has worked here for more than 40 years and is deeply committed to the progress made for children’s rights and well-being in Ethiopia, is responding with emergency relief in the form of supplementary food — sacks of Famix, a high-protein, ready-to-eat mix of whole roasted corn and soy flour. In recent years, the Ethiopian government has worked hard to build the nation’s economy and infrastructure. We are committed to providing help now, so that Ethiopia can continue this progress in the future. On our way back from visiting with families, we saw ChildFund staff distributing supplementary food for the children. The parents seemed happy to receive it. Yet when I’d left the homes of those I’d visited earlier in the day, their faces had been sad. They hadn’t been able to share their harvest with me as they had in times past. Any assistance provided now can help enable our friends to weather this crisis and enjoy many fruitful harvests in the years ahead. Find out how you can support our Ethiopia Food Crisis Appeal by visiting our Emergency Response page.